One of the aims of this blog is to expand its coverage beyond the S.League into the continental level, which I'm glad to say that I managed to fulfil that task as an obscure blogger. Just as people tend to see the glamour side of these continental tournaments (i.e. 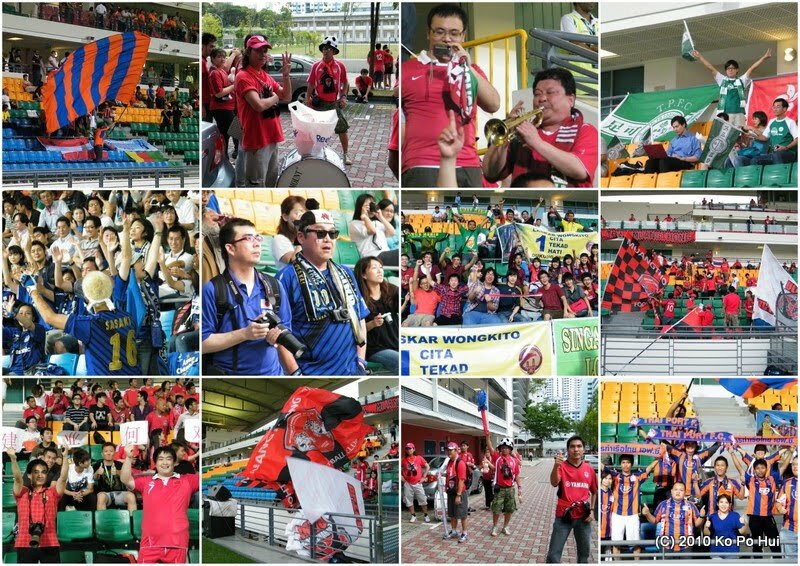 :the Asian Champions League and the second-tier AFC Cup), I thought it would be an eye-opener to take a look behind the scene of running the events, which is an arduous task for those who were involved. (Picture above) Colour code of various type of passes and bibs were clearly illustrated on this glass panel. Credit to this volunteer whose task was to sort these passes. Being prided as the top-two continental tournaments, it's inevitable that the organizers - the AFC and the relevant local sub-organizers would have various pass issued to those involved behind the scene. From the AFC officials, players, coaches, team officials to the media, security, ball boys and even cleaners were being given a pass for identification purpose. I applied for a photographer pass, therefore, due to regulations my "working area" was behind the goal during the game. While the only time when those in the orange bib were allowed to roam along the touchline was after the end of the teams' warming up session till the coin-toss before we hurried back to where we supposed to be. "The working area" where I positioned during the ACL matches, notice the space constraint between the wall and the billboards (due to regulations). Muangthong United of Thailand - posed for this shot, it wasn't an easy task to get your camera focused and snap when there were a dozen beside you jostled for better positioning in a matter of seconds. Due to the strict regulations imposed (that come with a heavy fine by the AFC with any breach of it), I can only made my way out of the stadium to the venue of the press conference at the second level of the building by taking a "detour" route, instead of the "express" way from the field. As compared to the ACL, the AFC Cup (pictured above after the Geylang's 1-0 lost to Thai Port) seems to be funded solely out of the coffers of the AFC as we don't get to see the setting plastered with sponsors' name as in the elite tournament (pictured below). (Pictured above) Noticed the two bottles of "Pocari", the matchball and label of the mike-stand in front of SAFFC's coach Richard Bok? Meeting the deadline is always the most important task for every journalist, like the lady Japanese reporter filing her story on her laptop while the post-match press conference was still on-going. If there's not enough to satisfy the thirst for more juicy information, this was how things turned out after heavy-spending Muangthong United lost to SAFFC, where the man in the focus (apparently is some top guy from the Thai club) was surrounded by cameras and microphone answering in Thai what could have went wrong.